Psychology department chair Richard Zinbarg discusses controversial visiting scholar Satoshi Kanazawa on Wednesday. Zinbarg said that, under the department’s revised vetting process, Kanazawa would have never been allowed on campus. 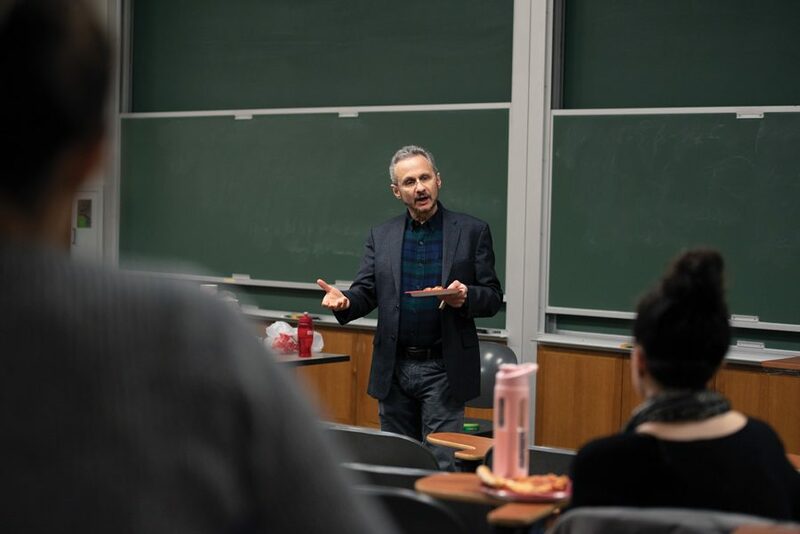 Northwestern’s Psychology Department has revised its vetting process for visiting scholars in response to Satoshi Kanazawa’s controversial appointment, department chair Richard Zinbarg told a small group of students at a town hall style event on Wednesday. Kanazawa — whose work on race, gender and religion has drawn heavy criticism for promoting racist and sexist views — is at Northwestern on a yearlong sabbatical from the London School of Economics and Political Science. Kanazawa’s request to come to Evanston was approved by a “sponsor” in the department and signed off by other faculty members before arriving on Zinbarg’s desk, he said. Students — especially black women — have expressed that they feel uncomfortable with Kanazawa’s presence on campus, going so far as to circulate a petition calling for his removal. Had Zinbarg known the nature of Kanazawa’s work, he said, he wouldn’t have approved the request. In order to combat similar future incidents, the department’s new vetting process — which has yet to be formally finalized — now requires that anyone who wants to become a visiting scholar submit their curriculum vitae to a personnel committee, Zinbarg said. All faculty in the psychology department will then vote on the appointment before the person is allowed on campus, Zinbarg added. The department considered writing a public letter denouncing Kanazawa, but eventually decided to write to Weinberg Dean Adrian Randolph instead. Psychology faculty also initially considered asking Kanazawa to leave, Zinbarg said, but found no legal footing on which to do so. If Kanazawa were to act according to the views expressed in his work while at Northwestern, he added, the department may have been able to remove him based on Title IX, which protects against gender discrimination in education. Zinbarg defended Provost Jonathan Holloway, who has drawn the bulk of students’ anger since mid-December, when he sent an email explaining that Kanazawa would not be removed from campus and reaffirming the University’s commitment to academic freedom. During the town hall, Weinberg sophomore Ahmadu Simpson asked how Zinbarg felt about Holloway’s argument that Kanazawa should be protected under the First Amendment given that his work is not up to Northwestern’s standard. Zinbarg said that, while Kanazawa has been criticized for his methods, the department is in a “gray area.” The limits to academic freedom exist, he added, but he doesn’t know where they are. SESP junior Olivia Barton asked Zinbarg whether Kanazawa was taking advantage of the University’s space and technology to continue doing work that “promotes racist and sexist ideologies.” Zinbarg said that to his knowledge, Kanazawa’s current work is on behavioral economics. Regardless, Zinbarg added, he wishes he had paid more attention when Kanazawa’s request had first come to his desk.